[Back] The test will run on 15 March 2019. This page defines some of the areas you may want to focus your study. Remember to check back regularly for any updates. There will be four main questions in the exam: Symmetric Key (Unit 2), Hashing (Unit 3), Public Key (Unit 4), and Key Exchange (Unit 5). Key principles: Salting, AES, ECB, CBC, Key entropy. Key principles: Hashing, Hashing Formats, Time to crack, operation of converting passwords to password with salt. "We have confirmed, based on a recent investigation, that a copy of certain user account information was stolen from our networks in late 2014 by what we believe is a state-sponsored actor," Lord wrote. "The account information may have included names, e-mail addresses, telephone numbers, dates of birth, hashed passwords (the  vast majority with Bcrypt), and, in some cases, encrypted or unencrypted security questions and answers." Key topics: Diffie-Hellman, Simple DH calculations, ECDH operation, Passing with public key. Eve says that she sees the values passed within ECDH by Bob and Alice, and that she can crack the key. By explaining the ECDH key exchange method, outline how it would likely to be difficult for Eve to determine the shared key. Calculate the time taken to crack a code given a time to try each key, and for the number of processing elements. Sample question: If it takes 100 years to crack a cipher code, and computing power doubles each year. How long will it take to crack a code after five years? Understand the features of differing encryption methods such as AES, DES, 3DES and PGP. Sample question: How does 3-DES differ from DES when encrypting data? Understand how passwords are stored and the weaknesses of these methods. Sample: What methods might an intruder use to determine the passwords on a system, giving the hashed values of the passwords? Define the salting process for passwords. Sample question: What are the key advantages of using a salt value for a password? Understand how the Elliptic Curve process works, with a simple example. Understand how the Diffie-Hellman process works, with a simple example. Understand how the Elliptic Curve Diffie Hellman works, with a simple example. Remember to review sample paper [here] for some sample questions. A table you might use is provided here. 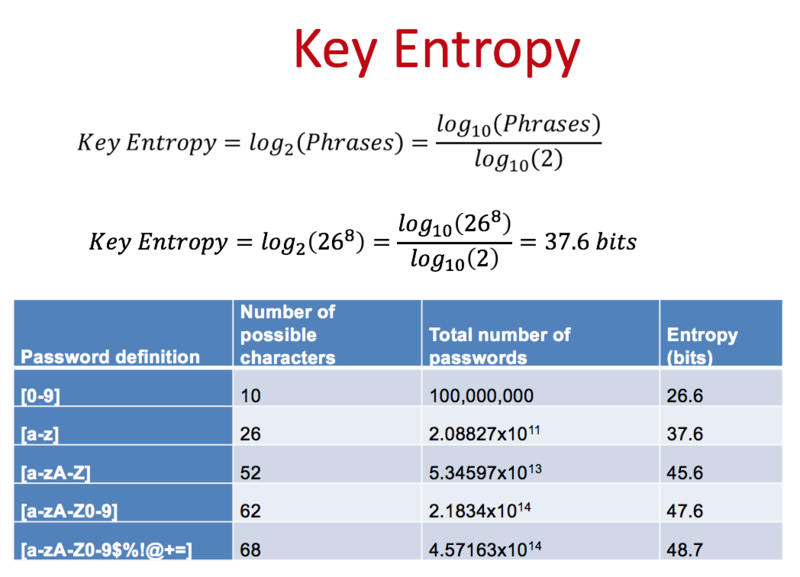 Now, we can use key entropy which will determine the equivalent key size for the limited range of key. Thus if we are using a 128-bit encryption key, we are not using an equivalent of 50 bits, which considerably reduces the strength of the encryption process.